The Hidden Glasgow Forums • View topic - Subway pre- and during modernisation - in colour! Ok folks, after much frenzied scanning for yesterday's "sad bus enthusiast" thread over in the Coffee Lounge, I thought I'd keep the kettle boiling, so to speak, and get round to the other pics I've been meaning to scan. Like my previous postings, I'm afraid these are all the work of another that I'm scanning, but I only do so in the hope that at least a few of you go out and buy the book they're taken from. It's probably a bit of a minority interest subject, this, but I know at least a couple of you will enjoy these! 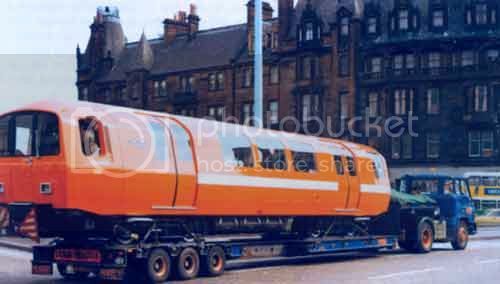 The pics here are all taken from a fairly new book I stumbled on a month or so ago called Glasgow Subway Album, by a chap called George Watson, and published by Adam Gordon, who also published The Twilight Years of the Glasgow Tram, which I shamelessly "borrowed" from for the pre-1980 colour thread. 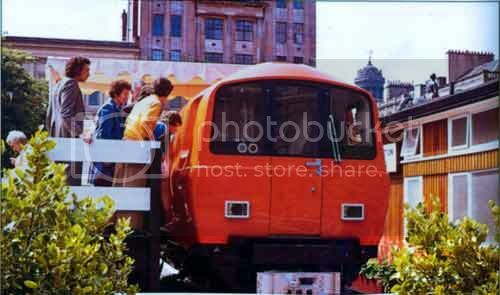 George was lucky enough to be working for the Greater Glasgow Passenger Transport Executive during the last years of the old underground, and he documented it in photos in the run up to its closure in May 1977 - although it actually closed a few days earlier than planned due to the general rundown nature of the system! He also captured a few interesting scenes during modernisation, although he was to leave his job before the system reopened - was that 1980 as I recall? ...as can be seen in this elevated view from the same position. Partick Cross Station - now, of course, Kelvin Hall. Being the last few months of service, very few ads are still on display. And for all the modernisation they did to the station itself in 1980, that little alley leading up to it is still dingy as hell! Merkland St Station - the only station not retained in the modernisation, it was instead moved further west and integrated with Partick railway station. Apparently the cavern of the old station still exists - can't say I've ever noticed it on my many underground trips, anyone else?? The ticket office of Merkland Street station. Hillhead - decidedly less talent on view here than there usually is these days. Oops, did I just type that out loud...? Cessnock Station - and again, natural light looks to be present in this long passageway - I'm sure from my last trip there that it's totally covered now. Buchanan Street - looking both quieter and a lot smaller than the current one! Last edited by gap74 on Tue Aug 03, 2004 8:31 pm, edited 1 time in total. This is absolutely fascinating stuff. Do you know how to access the disused underground stations? If so, would you be willing to take me? Perhaps a small group of us could go and make a morning/afternoon/day of it. Top stuff Gary. Great photos.... may buy the book myself. You on commission? I concur, brilliant stuff. Really looking run down by this point, but still with a shabby charm. The Copland rd station certainly had a big glass roof back in the day, there are a couple of pics of it in the virtuall mitchell under "copland rd" from around 1900 as far as i recall. Oh, and i'll certainly purchase the book. OK, here are a few exteriors, and some depot shots, as well as the last days of the system. Bear in mind that many of the stations were in a sorry state by 1977, with the still fairly new motorway isolating them, and the tenements surrounding them often demolished. West St exterior - eek! St Enoch, of course - not much change here, apart from the ruddy big railway station and hotel in the background being replaced by an outsize greenhouse. Merkland St, the one that disappeared. Nice old 303 in the background too! This shot is apparently after closure. Kinning Park, which gets my prize for the most inviting entrance of the lot! The Broomloan Rd depot, complete with cat. The depot again, and some men appear to be banging heavy things around. The pit - now as you all are no doubt aware, the modern subway branches off just outside Govan station where the tracks rise to ground level and the maintenance sheds. In days of old, however, they did things in the hardest way possible, and the only way to get trains up and down was to hoist them using this pit, straight onto the running rails of the circles. It was also, apparently, an unofficial stop for the trains to pick up and put down subway workers - as appears to be the case here! A bit blurry, but one of the very few interior shots in the book - and a lovely collection of Glaswegian wifies! Incredible photos... just ordered the book now on Amazon - amazing photos! OK, the last lot now, and these depict the final runs, and some modernisation work. End of an era, although the last public trains apparently ran on the 21st May, with a final run for the press and invited guests on May 25th. And here is that final run, with the train at Bridge St apparently running round the outer circle the wrong way - a final show of defiance perhaps? ...And it's all over - I think this is a lovely, evocative shot, the last train just gone, the station master stands alone on a deserted platform in a station without trains... Almost brings a lump to my throat! Or is that a goitre..? Damn, wish I'd been there! Wonder how many people have these things sitting up their loft?? Next, start laying track and building new platforms, such as is the case at Govan here. Now build a ridiculous mock-up in an old sub-station, to show people how the lovely new system will look. Choose dummies as far removed from the appearance of the typical Glaswegian as possible. That's all folks, plenty more interesting pics in the book, but I ain't gonna scan anymore cause I'll get RSI, and perhaps a cease and desist order! Obviously the transport museum got some of the old signage, but there must be so much more of it out there judging by those pics. That shot of the station master alone... perfect. And those dummies are so scary! gap74 wrote: OK, here are a few exteriors, and some depot shots, as well as the last days of the system. Pgcc93, Ronnie ... that chat about that building on Bridge street on Sunday.. could this be the building Crusty was talking to me with the hatch? Re: Subway pre- and during modernisation - in colour! your train passes through the chamber. Correct. It is indeed covered over now. insult by being used as a surface car park. we have today are bad enough, but some of them old 'uns were shocking. kn0wledge wrote: This is absolutely fascinating stuff. Do you know how to access the disused underground stations? If so, would you be willing to take me? Perhaps a small group of us could go and make a morning/afternoon/day of it. although a serach for that could be an interesting project. Yes indeed - one of the pics I didn't scan seems to show that Merkland Street station was somewhere behind where Safeway is now, although I would be curious to have a peek to see if there is indeed any manhole or other similar surface access arrangement there. I'll be buggered if I'd want to go down there, though, even if it was relatively easy to do - and I don't imagine the security of such an access point would be at all lax! Sadly, I have no connection with the underground whatsoever (otherwise I would happily shut down the system to attend the wedding of a colleague...), so cannot give guided tours of the system, authorised or not! This was in George Square. Ahhh I thought that the abandoned stations were no longer connected to the main line, and that they'd be easy to get into. My mistake.